Moving to a big new city is full on. Luckily, I'm loving the change, grounding my roots and enjoying all of the busy-ness. I grew up in a place that boasts many city-like qualities, but its small scale - petite and modest . I like it like that and up until a year or so ago, I'd never imagined living in New Zealand's Big Smoke - the intensity and fast paced nature of it all, seemed a bit too much for me. However, when I decided I wanted to seriously head down the holistic health and food path, the Auckland doors opened with some opportunities for me to study nutrition. I opened my mind to it and great things happened. I'll gladly admit this new Auckland adventure packs a lot of punch and I'm loving every minute of it. Naturally, I've been seeing and experiencing many new things here, and all of this exploring has seriously got the creative juices flowing. I'm buzzing with ideas for the blog. I've been so energised with all things new (along with a lovely holiday after leaving Korea to really clear the mind and fill it with lots of new goodies and thoughts), that I couldn't help myself... I've decided to revamp the blog! I'm not going to give away too many hints. But there are definitely going to be some big changes. I'm excited about it, and hopefully you are too. 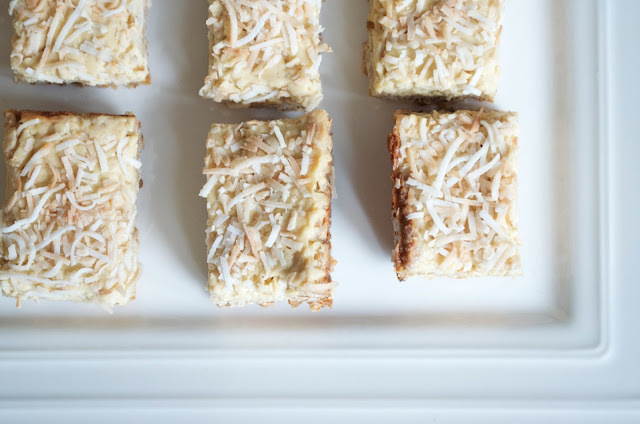 So as a (pre) celebration for the blog's new look and a 'hooray' to new beginnings, I thought I'd whip up this coconut slice. I love it because it's not as rich and dense as many sweet treats can be. But it's very definitely still treaty! I've actually grabbed this recipe from one of my new (and favourite!) cook books - Sprouted Kitchen, by Sara Fort with photography by her man Hugh Fort. 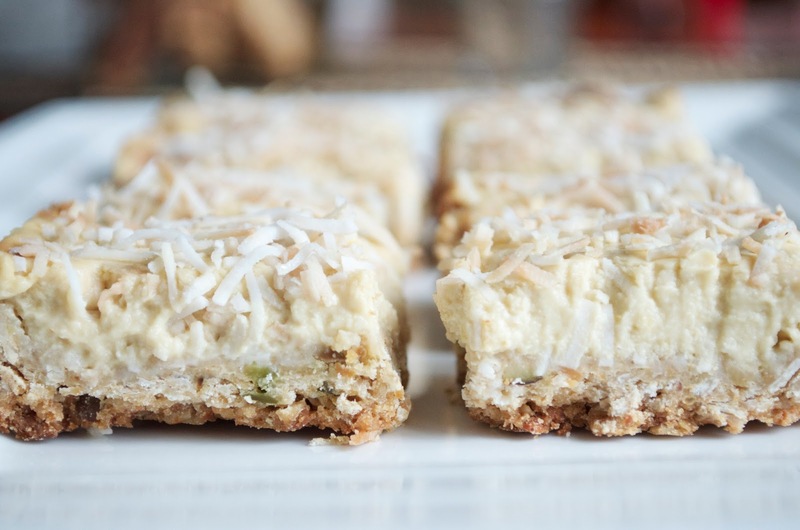 I've been wanting to share one of Sara's recipes for a while now. I love her work, writing and food. And considering I'm on a creative and motivational buzz right now I thought I'd share a recipe from someone who very seriously inspires me to stay in that frame of mind. Coconut is also something that gets me inspired! It's delicious, versatile, really, really reeeeeally good for you and did I mention it already??... DELICIOUS! From a nutritional perspective, coconut oil wins all round. However, I've decided to pull back a little with my nutritional facts until I start studying (don't worry my first day of school is tomorrow!). The internet is packed with a whole load of information about what might be good for you, and what might not be and I'm by no means discrediting the wonders of the interweb. Therefore, I really want to make a conscious effort to start sharing in-depth facts about food as I learn them through my education. 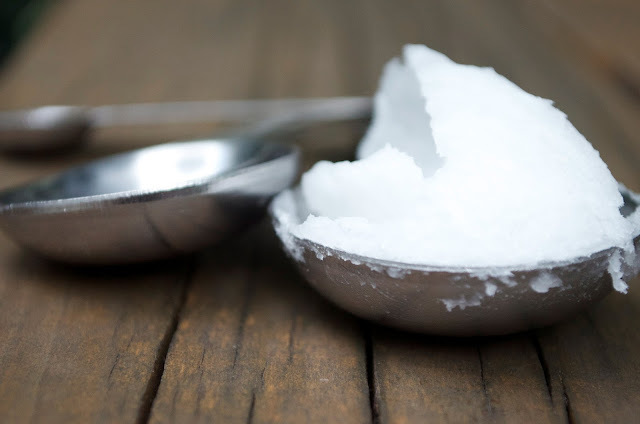 But for a bit of background on coconut oil (because really, I just can't help myself!) - it contains medium chain fatty acids that are quick and easy for our bods to process, digest and convert to energy. So, if combined with a healthy balanced diet, and eaten in moderation, coconut oil is not a fat to be feared, but rather celebrated! It's important to know that our bodies need particular fats to work properly; just like putting oil in our cars to make them run - without it, you just wont go. I've adapted this recipe a little. Mainly because I didn't have the exact ingredients on hand. When I made it, it did look a little different to Sara's, and it set differently to what I'd imagined. But I was still satisfied. I really enjoyed the addition of a little salt, and wholegrain oats - it gave it an earthier and wholesome flavour. Perfect with a cuppa in the evening when you need a little extra something, but don't want a super sweet hit. Give this a try if you like and see what you think. Thank you Sara for your inspiration! 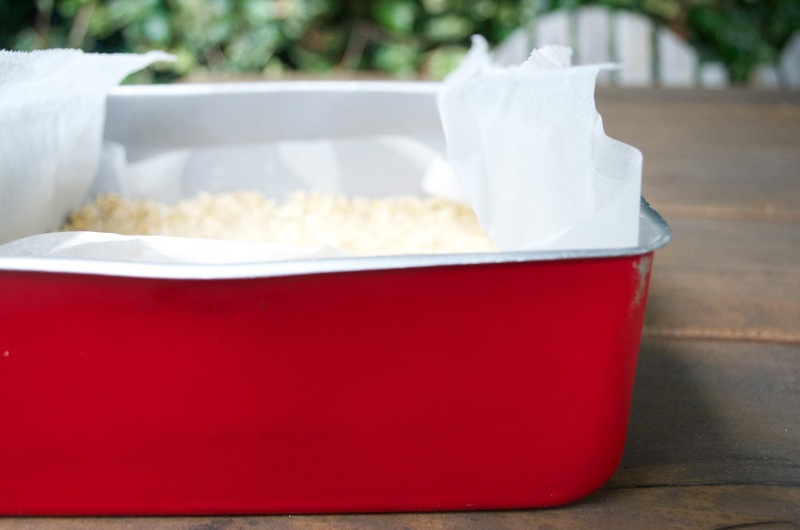 Line a baking tin (I used 20cm by 20 cm tin) with baking paper. Sara suggests using a pan with a removable bottom. I didn't have one but positioned the baking paper in such a way that helped me to lift out the slice from the tin with the edges of paper. Add the first three ingredients to a food processor and pulse until it becomes a coarse flour. Next add the honey, coconut oil and salt. Pulse again to combine. You may like to rub the ingredients together a little with your hands if the honey and oil holds together. Continue to pulse while slowly adding the water till the mixture starts to hold together (you may need a little more or less). 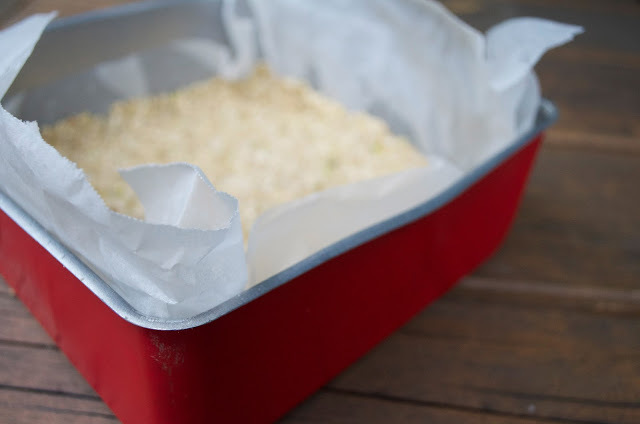 Evenly press the mixture into the prepared tin and encourage just a little up the sides. 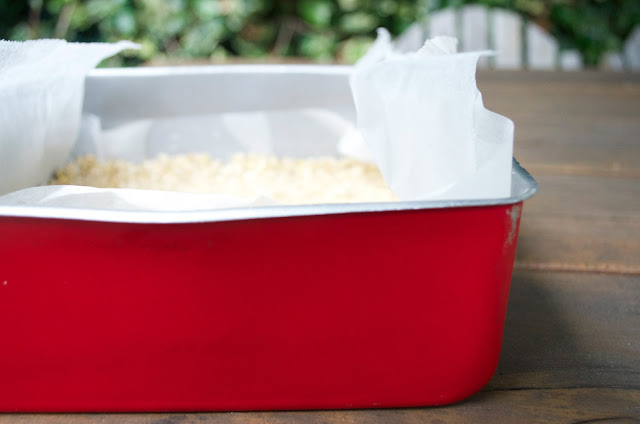 Cover and leave in the fridge to chill for 1-5 hours. Preheat oven to 190 degrees C on bake. With a fork, pierce the base a few times and put in the oven for 10-12 minutes or until it just begins to warm in colour. Set aside to cool. Turn down the oven to 160 degrees C. In a sauce pan add the coconut milk and bring to a simmer for 5 minutes. Remove from heat and whisk in the sugar, lemon zest and flour (sifted). Let it cool a little and then whisk in the lemon juice, egg, egg yolk, salt and vanilla. Leave again until it reaches room temperature then pour it over the cooled crust. Bake in the oven until the filling is just setting in the middle. The original recipe suggested 25 minutes, but I had it in the oven for about 40 minutes. Just keep an eye on it. When it's cooled a little, sprinkle over some toasted coconut and set in the fridge for a couple of hours (ideally overnight). Slice into your desired size squares, eat and enjoy!